When a child appears, Mom wants to doThe house is cozy and warmer. She lovingly chooses a cot, a stroller and other attributes that the kid needs. To the baby was interesting to spend time, my mother is ready to buy him any toy. Of course, we can not do without them, but things made independently, carry a special energy. 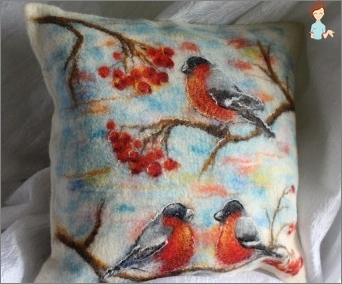 So it's worth trying to sew a pillow-toy with your own hands. Such products are very popular not only among children, but also with their parents. A pillow made in the shape of an animal, a boat or a typewriter, a geometric figure, is universal. It is soft, pleasant to the touch and causesChild interest. You can lie on it, throw it in place of the ball, use it as an armchair. Bright and colorful products made by own hands, can serve as decor, giving the interior a unique charm. Many babies like to take such toys with them to bed, they remind them of a home in kindergarten or traveling. In addition, they are easy to wash and wash - it will be appreciated by moms. Children's products carry a lot of functions, butOne of the main - developing. 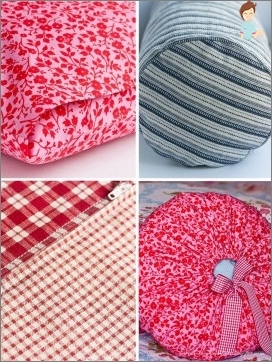 Soft cushions can be sewed from whole fabric or from rags, combine materials. The child will learn the texture, and develop sensitivity. A variety of colors will help you learn the colors faster. Which filler should I choose? To sew a pillow, first of all, you need to choose a filler. The filler should be hypoallergenic. If the filler is very dense, the product will turn out to be heavy and the baby will be difficult to carry it from place to place. And if such a pillow rushes, then it can injure the child. Of course, the product will often have to be washed. The filler should be practical and quick-drying. 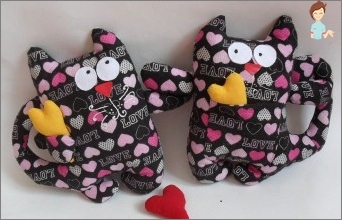 Producing their own softPillow-toys, experienced needlewomen recommend using holofayber or sintepuh. The modern version is polystyrene. 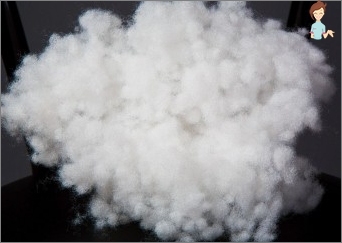 This is a special ball filler, which is used in pillows-mnushki. Doing your own hands with children's pillow toys, notIt is worth forgetting about security. Preliminary it is necessary to check up, whether is not present at the kid of an allergy on a filler. You can use only environmentally friendly materials. Each mother tries to develop her babyMotor skills, observation, attention and other skills. Experts advise to do this during the game, when the brain of a little man is most susceptible to information from outside. Developing pillow is designed for toddlers up toYear, but also older children will gladly play it. First, draw a sketch of the future product. Schemes can be invented on their own or taken from the Internet - it all depends on your imagination. For a basis it is possible to use a blue fabric in the size 53 20 cm and the same green one. For a pocket this material will be required 30? 20 cm, it needs to be folded in half. "Residents". Like fish, you can attach butterflies,Birds or dragonfly. Make a train or a typewriter on an elastic band. Flowers can be stuck on Velcro. During their research, the child will develop thinking, fantasy, fine motor skills. Schemes of pillows-toys that you want to make with your own hands, you can invent yourself or take over the experience of other needlewomen. The reverse side can be smooth and monophonic, so as not to distract the attention of the baby. Sew the pillow around the perimeter, pre-laying the filler. 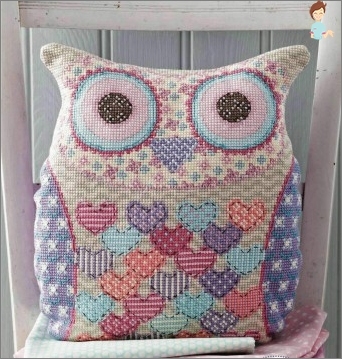 To make a toy-pillow of an owl with your own hands, you need to cut out a pillowcase from the main material, which will resemble an owl. The ears must be clearly marked. Cut out the detail of the oval shape from the finishing fabric, so that the height is 20 cm and the width is 30 cm. From the felt, open the eyes and the beak. Now you can proceed to collect the parts in one piece. Sew the applications with the wrong side to the base. To be more convenient, you must first sweep them. Pupils make dark, so that your owl's look is more expressive. Fill the substrate with filler and treat the edges with a zigzag seam. The reverse side can be decorated with felt, so that the owl was like the real one. It can be of different sizes. The height of this will be 36 cm, so you need a fabric 80x40 cm. It needs to be folded in two by the face inward. Make patterns of toys, put them on the material and circle them with a pen. To make it more convenient to cut out double parts, the fabric should be pinched better with pins. Before you cut, move away from the 1 cm line - this will be the allowances for the seams. Connect the parts with a seam "Forward needle". The fabric will not shrink when folded, if you make incisions in the corners. Turn the product out and straighten it. 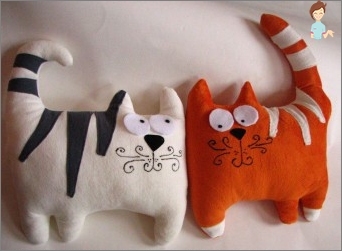 To the cat was volumetric and "alive", Fill it with filler and sew it with a zigzag stitch. Sew a tail to the body. The muzzle can be drawn in pencil and embroideredThread eyes, nose and mouth. On the tummy, sew a cross - this will be the navel. It's not at all difficult to make a cat-pillow with your own hands, if you make a little effort and have patience. Embodying various interesting and unusual ideas in life, you will not only please the baby, but also will be able to develop your creative potential. Some mothers even earn in a decree, making custom-made pillow toys with their own hands. Interesting ideas and sewing skills are the guarantee of their stable income.